All transactions are safe and secure with a reliable history in online purchasing behind each of our associates. Buy the Laguna Beach Lifeguard t-shirt to own Laguna Beach clothing and merchandise. 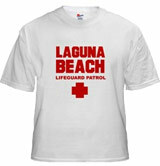 Let everyone know that you patrol the shores of Laguna Beach with this bestselling Laguna Beach Lifeguard tee. Whether as a girl, you've imagined yourself giving mouth-to-mouth to Stephen Colletti, or as a guy, you've imagined yourself performing similar life-saving techniques on Lauren Conrad, this MTV Laguna Beach t-shirt is perfect for you. The design also looks great on sweatshirts. In addition to the Laguna Beach Lifeguard tee above, browse the Laguna Beach Clothing Gallery for more apparel like men's and women's clothes, kids shirts or hoodies.